I have 2x Eaton/Bussmann 32145 Power Distribution Units. 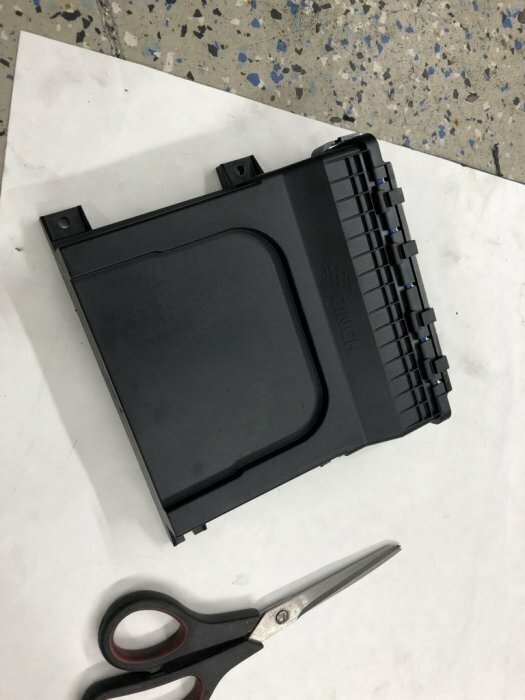 They have 10x relays and 16x fuses in each, and use Metripack 280 terminals to connect. I will include a few of the terminal housings, though you'll need some terminals and the gray housings (the other 3 colors are included). 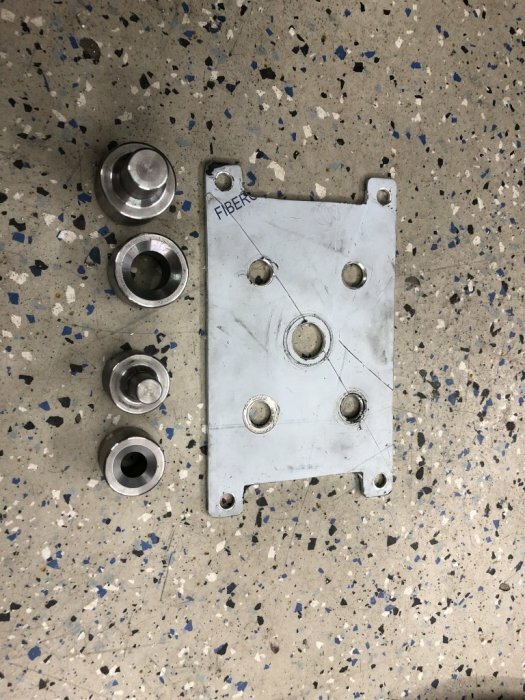 These are industrial grade pieces (literally) and a great way to build a custom harness for a racecar project. I had bought them to use in my car, but ended up going with similar units that integrated CANbus units. 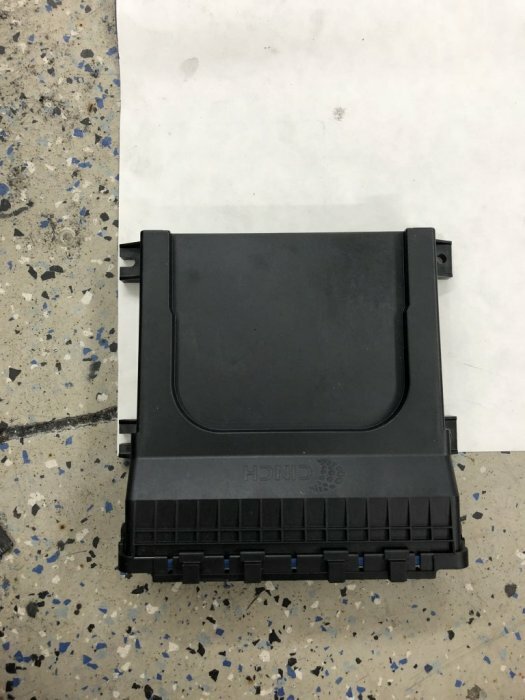 They are similar to these here: https://www.waytekwire.com/item/46065/EATON-s-Bussmann-Series-32S-300-0-Dual-ssDVEC/ but have a slightly different wiring diagram. I can provide the diagrams for you in PDF form as well as some documentation I wrote as a cheat sheet. These were in my 1965 Mustang as I built it, but are being pulled out and will be cleaned up and ready. I will include a few fuses and relays, but it is not enough to fully populate them, they use micro fuses and ISO280 relays. (it's the bigger box in the photo, with the red shields for the power input lugs) Lids/fuse pullers/etc are included. So, some of you may remember a while ago when I made a little Arduino based CANbus controller to drive some little OLED gauges to display data from my AEM Infinity. Well, since then, I've been looking at all of the custom gauge clusters that Holley, AEM and others have made and while they're neat, they A) don't fit my sizing needs, B) are expensive and C) are limited in what they can do. So.... screw it, I'll do it myself because that's what I do. Anywho, I bought a "Manga Screen 2" which is a little 5.9" 1080P HD touchscreen and a Raspberry Pi to beta test with. I'd originally planned to use software called RealDash and interface it to CANbus via SPI on the Pi. Unfortunately, they won't give me or sell me a Linux build, only Android, and integrating it with Android on the Pi is tedious and limited at best. They also have a nice way to do that, but they won't sell me that either. So... screw 'em, I'll build my own software. Use Raspberry Pi + Arduino for prototyping; I might move to NanoPC-T4 or similar later, with more horsepower. Right now I'm just looking to make a little standalone display, which I think won't be too bad in QT. Feed it data from SPI (serial) and boom, gauges. Fully customizable, fancy, color, touchscreen gauges. But since I've got a touchscreen now... the stock HVAC controls that came with my AC kit are ugly and dumb. I don't like them. They just run some servos and crap, so I figure I can replace them with solid state bits either controlled directly from my single board computer (Pi or other) or via an Arduino that is controlled by the Pi. Then I can take up less real-estate with the ugly controls, and not have to spend 400 dollars (dafuq?) on the nominally less ugly controls. In the meantime, I'll just dangle these controls off to the side so that I can run HVAC while I develop it. Anywho, that's the plan. I'm not really planning on selling this, but everything I make is always open source, so if you're so inclined from a nerd standpoint, you'll be able to replicate this with modifications for your particular implementation. FWIW, the tech in use here is basically what the OEMs are using for digital gauges and infotainment, so if I can find the time to learn it, it should be pretty powerful. The nice thing is there are already frameworks for most of it, and odds are, the people designing this stuff at the OEs aren't magicians, so I think I can sort it out. We'll see what I think of this post a year from now, hahaha. I was watching Wheeler Dealers tonight, they were working on a Ford/Mercury Capri and had some parts 3D printed... by Jeff Jordan. @Jordan Innovations. My wife was notably less impressed than I was when I woke her up going "Hey! I know that guy!" I've been working on a few behind the scenes things on the forum; mostly fixing some errors/caching/behavior/housekeeping. Hopefully things will run a little faster going forward. I've also enabled/forced SSL access everywhere, for increased security. A few things still aren't 100% forcing, so that will take a little bit to finalize, but we're 98% of the way there. I'm also working on moving the last of the gallery images in threads from the old (Aeva Media) gallery to the new (SMF Gallery Pro). This is a lot easier to use (once you get the hang of it) and is still supported and more secure. I'll have a user guide for it put together shortly (hopefully in the next couple of days). If anyone has any trouble, please let me know. The Lounge / New Gallery! Our old Gallery function was getting pretty long in the tooth as it was no longer supported by the creator. 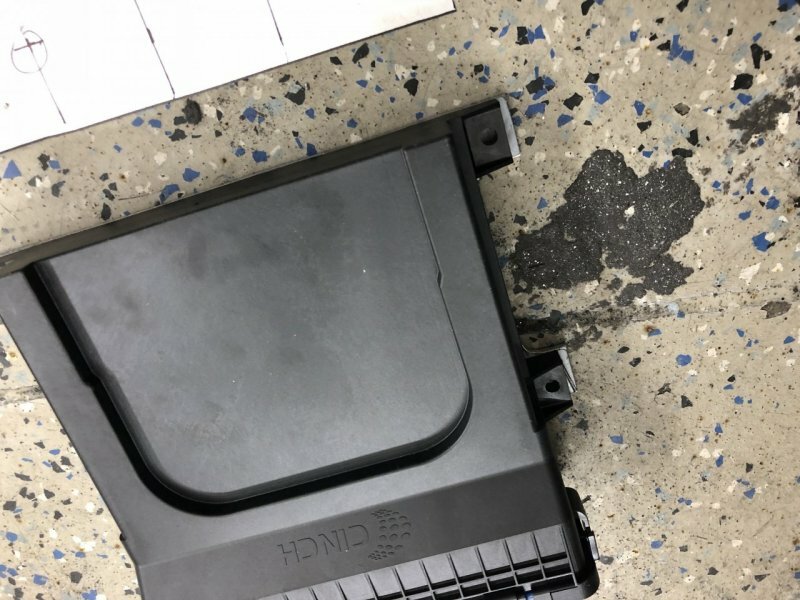 It was also prime for a few security holes. I purchased a new gallery (SMF Gallery Pro) and I've done an import of all of the photos from the old gallery into the new one. That appears to have gone well with 98% or more of the images transferred over. I have now disabled the old gallery from being modified, though it is still serving images in threads. I'm going to be working on updating threads to use the new gallery (basically replacing the old image link with the new) shortly, after which I'll nuke the old gallery completely and we'll be fully on the new one. The new one has drag/drop uploads, external linking capability, etc., so I think it'll be a better solution as well, and easier to use. I'm also going to be moving the whole site to SSL again shortly. I had done this previously, but we had some issues with the old gallery, so I re-enabled non-secure traffic. This isn't great, so we'll be doing the SSL force again shortly (probably this weekend if I get cycles). Just wanted to throw a quick update out there on status. 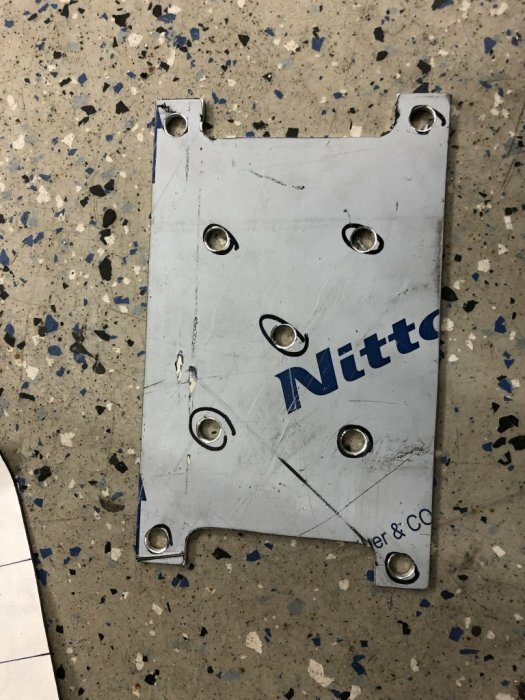 So, when building cars that are full of crap that they were never intended to be filled with, you'll find that you often need to bolt that crap to other crap. In the case of my 1965 Mustang build, I have a bunch of IP67 rated electronics boxes that house my CANbus based control system for lighting, horns and other accessories. 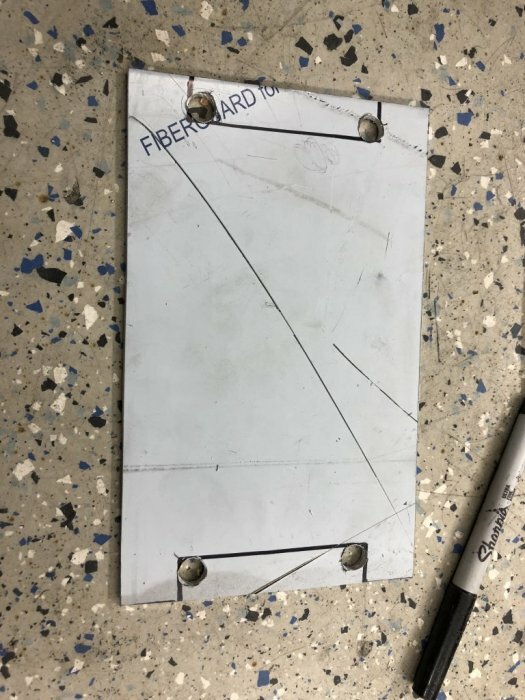 I made a bracket to hold a couple of them over the past few days, so I figured I'd make a quick overview of how I typically make a bracket, and figured I'd share the method. Please note, there are a TON of different ways to skin this cat, this is just my method. Step 1: Get stuff together! 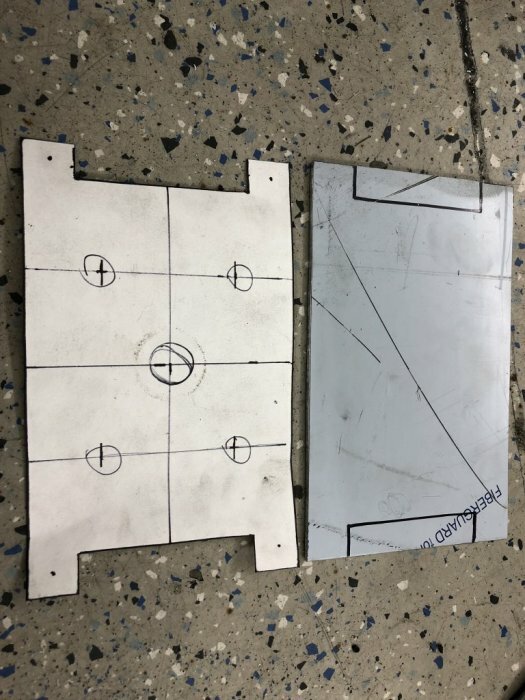 This is the box I'm going to be making a mounting plate for. Step 2: Square up your paper. I use the square to make sure my edges are true to each other. 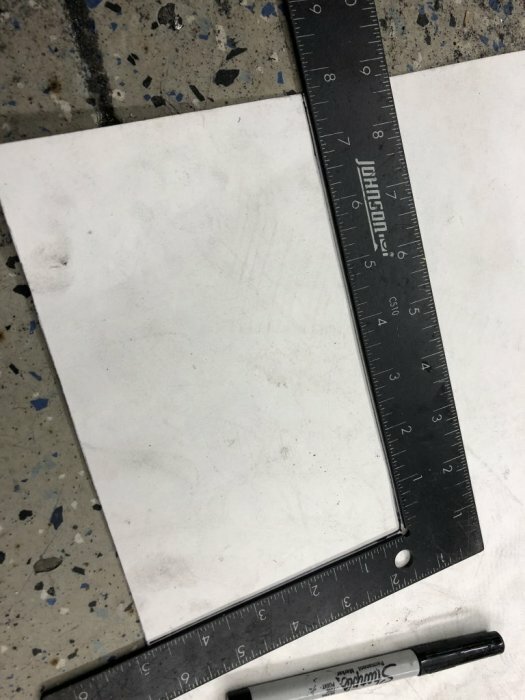 Step 3: Set the item you're mounting to the bracket on the paper and mark dimensions. 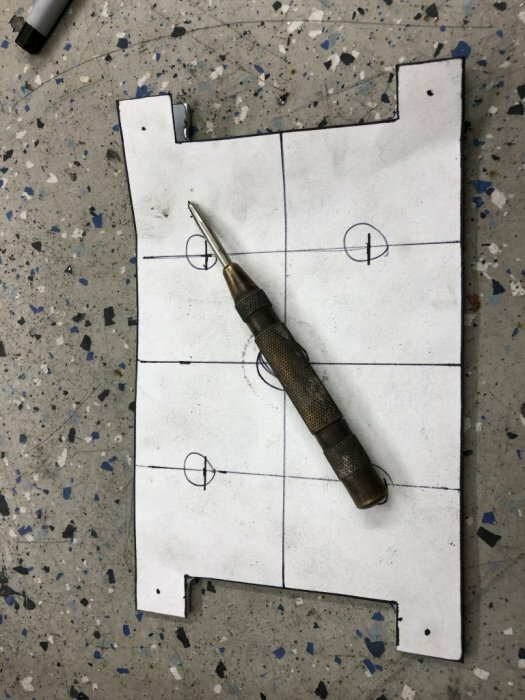 I don't want the template to take up the ENTIRE bottom, so I'm just aligning it with the screw holes. 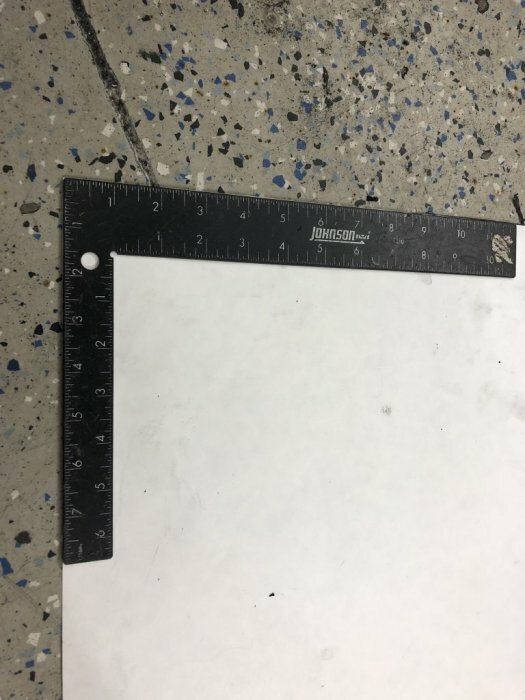 Step 4: Square up the marks you just made for the dimensions in step 3. 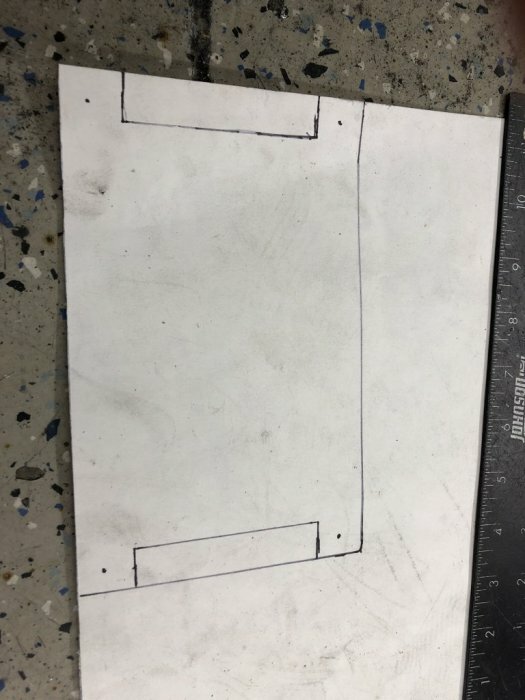 Step 5: Mark any holes and other parts of the shape that vary from the big rectangle (or whatever) that you just drew. I simply set the box on the template and used a thin Sharpie through the mounting holes to mark center. 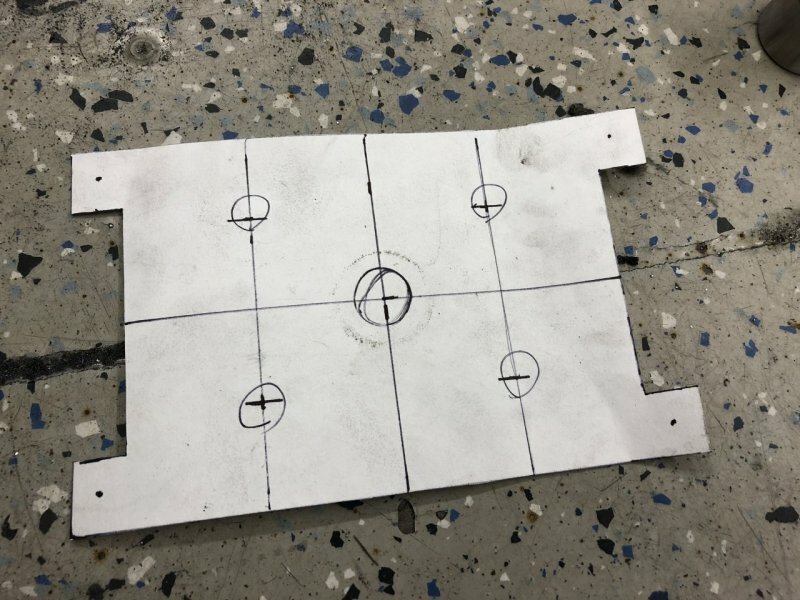 Be sure to keep this stationary and pay attention, as marking these accurately is key to the bracket fitting well. Step 8: Trace outline on aluminum. 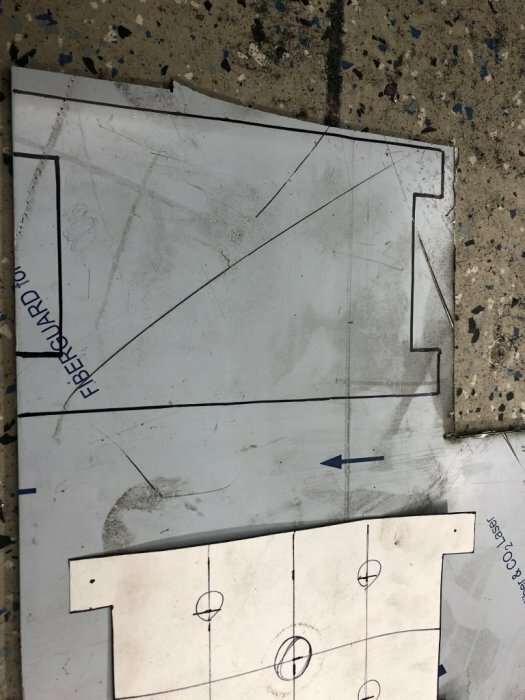 You can tape the template to the aluminum if that helps. Double sided (thin) tape can help also if it's particularly difficult to trace. This was easy, so I just set it in place and held it while I traced with a Sharpie. Remember which side of the Sharpie mark you need to cut on! I usually just mark it so that I'm cutting dead center on the line, but on dimensionally critical things, it can help to use a fine Sharpie here. Step 9: Rough outline cut, checking against template for accuracy. 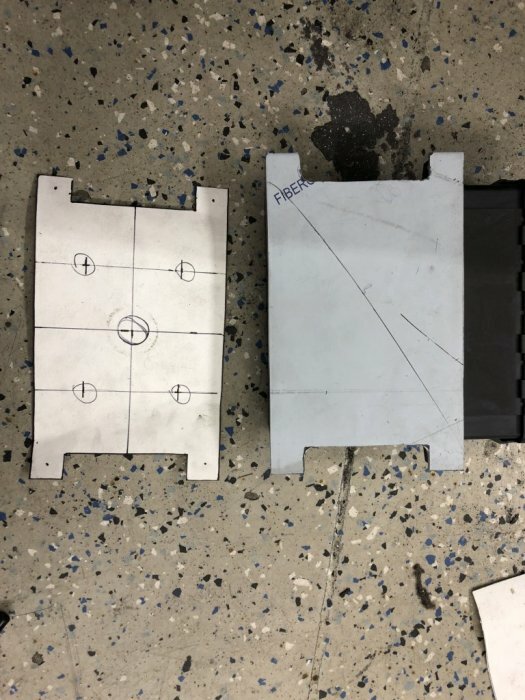 Check often, so that you don't end up with a ton of effort put into a part that doesn't fit! Step 12: Mark the holes that need drilled. 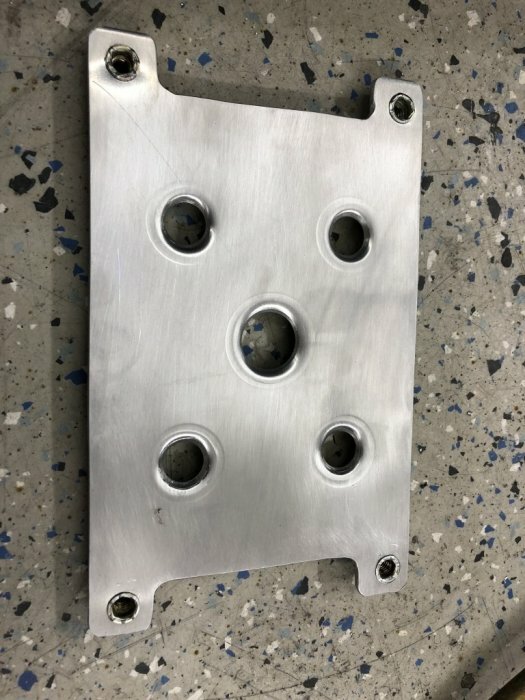 I use a spring loaded punch and set the template on the aluminum and punch the hole centers. 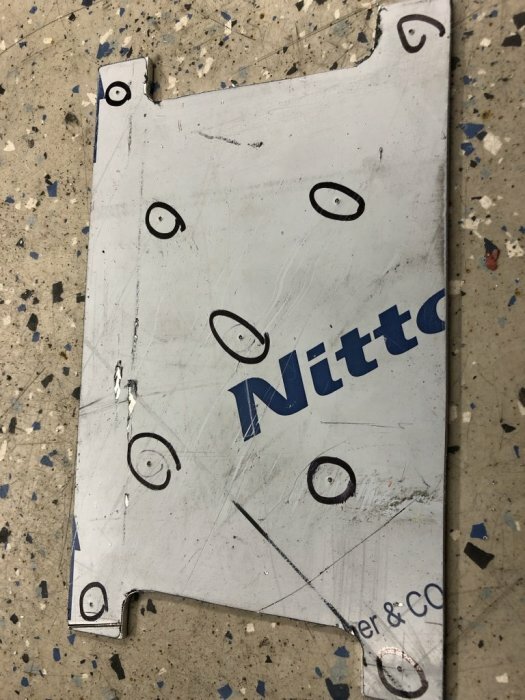 I circle the holes on the aluminum to make sure I don't get confused. Step 17: Rivnuts. Read about rivnuts if you're not familiar them. They are AMAZING! I have a cheap tool that you use a socket and box end wrench to install them with. KEEP IT LUBRICATED! Breaking this up into two posts because it's LOOOOONG! So, quite a few of you guys know that my family races Top Fuel bikes; several years ago we had a second bike on our team, with a rider named Jimmy Brantley. When he ran, I worked on his crew (this was way back in 2006). He had to step away from racing for a while due to work, but he's coming back next season and needs a new team built. So, I had offered to go work on the team again (they run a small schedule, about 6-7 races a season). I was informed this last weekend that I'll be the new crew chief on this bike. 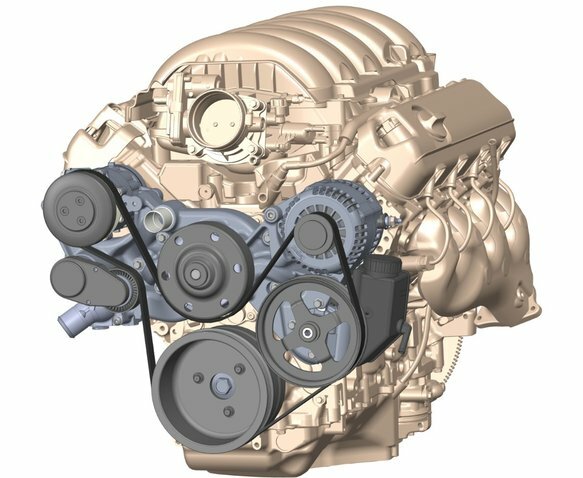 I have a LOT to learn, but I'm pretty excited to get into the minutiae of tuning a nitro engine and helping run a successful team. I'm still waiting on the final details, but it should be pretty interesting. Saw it at PRI last weekend and it's a pretty slick setup, VERY tight to the engine and could probably work well with some turbo setups also. Considering it's all new parts and complete, the pricing really isn't bad either. Which was probably my favorite new LS thing there. 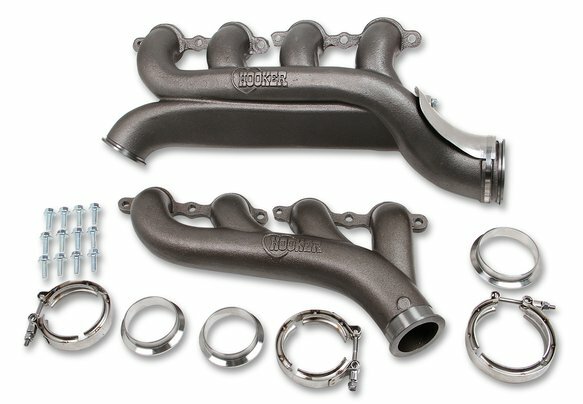 Built in high flow log style crossover manifold for turbo setups. 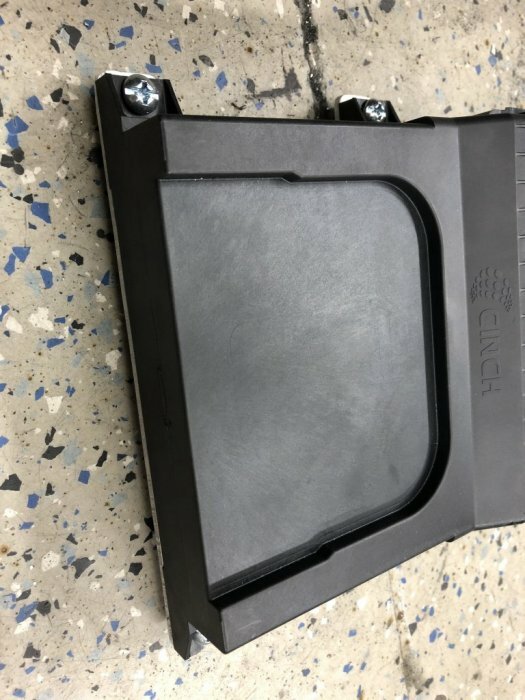 Pretty freaking slick and it should fit an FC/FD pretty easily. 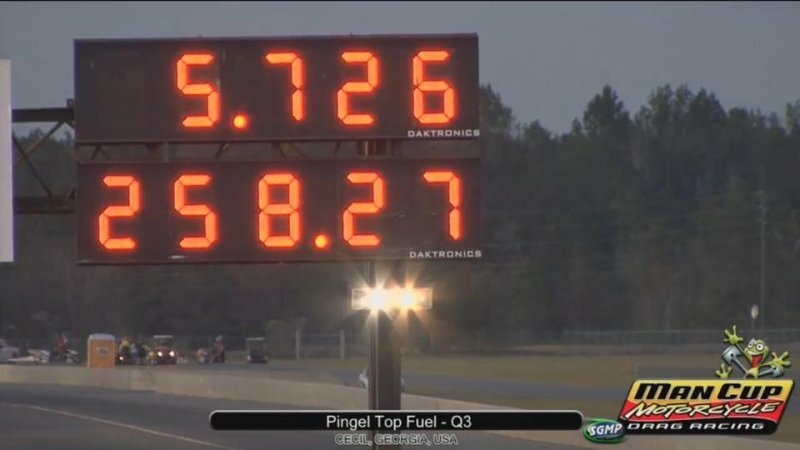 So, my family races Top Fuel Motorcycles (http://www.larrymcbride.com/). My uncle, Larry, is the rider and my other uncle, Steve is crew chief. They've won quite a few championships (18 as of now), but for the past 7 years they've been chasing a 5.6xx pass. The record was taken by Swedish rider Peter Svensson and they wanted to get it back. Since 1994 Larry had been racing the same bike, but two years ago they had a bad fire caused by an engine failure. This caused massive damage to the bike, taking it out of commission. They had a new bike in progress and finished it for the following season. Fast forward a while and they've been making progress on figuring out the new bike, which had a new fuel system, clutch, and a few other things. 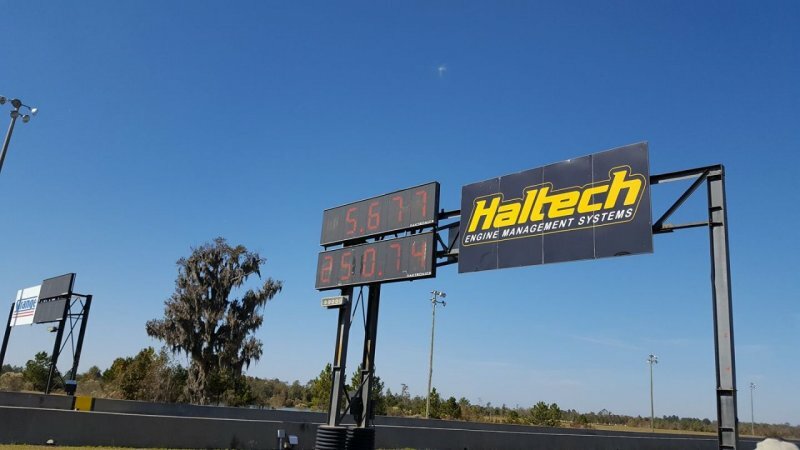 The past few races they've been inching in on the record and ran a 255.26 MPH pass (record was previously 255.00) and a 5.743 (record was 5.746), but hadn't hit the elusive 5.6xx pass. 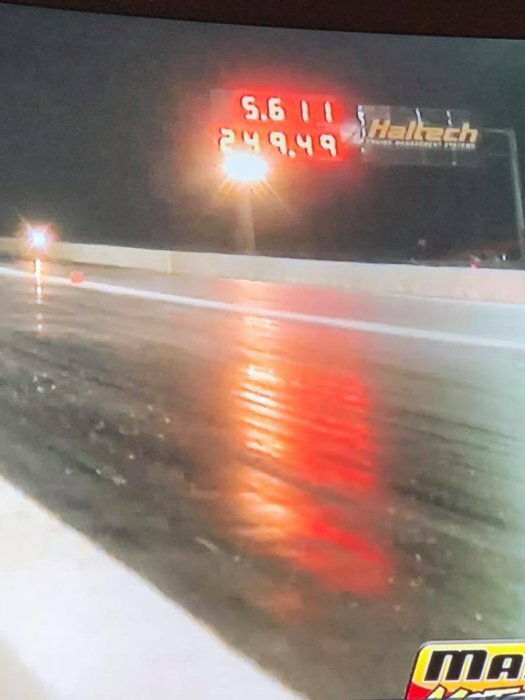 That's a new world MPH record. That's pushing hard on 5.5xx passes now, and 260 MPH. 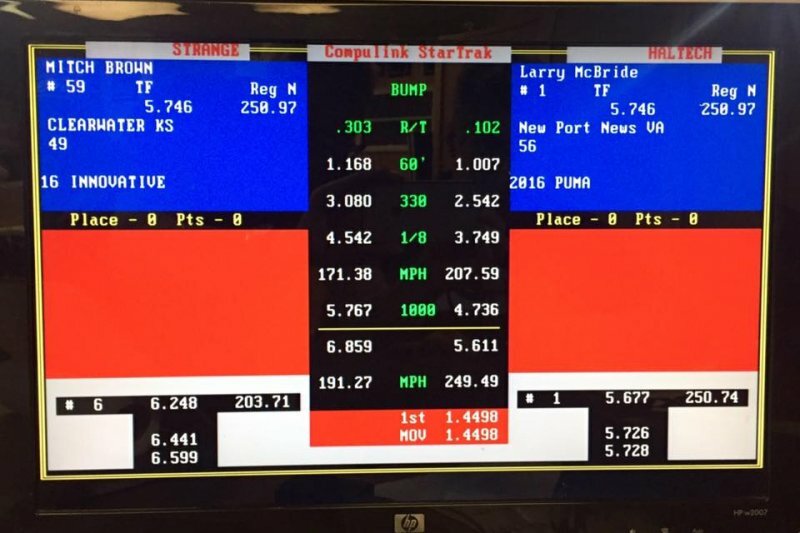 If you follow motorcycle drag racing, these numbers are basically unbelievable. Figured I'd share with some people who appreciate performance, as this was one hell of a performance. The Lounge / Chinese CNC - Thoughts? 1.5kw water cooled VFD spindle, USB control, 60-90mm of Z height, and ~600 x 400mm of X/Y. It can't do anything beefy, but I think it'd cover about 95% of my needs that I can't do with my 3D printers. Plus I can always modify/improve it later, like adding more rigidity and z-height, etc. Anyone played with anything like this? I fully expect it to need a bunch of fiddling, but I can certainly handle that part myself, and it seems that quite a few people use these things successfully. I know an old Bridgeport or something would be better, but I don't have the room for it, or the time to convert it to CNC right now. The Lounge / Side project... drill press restoration! So a few years ago my father in law gave me (well, it's on "permanent loan" i.e. it's mine but I cannot sell it, not that I'd want to!) 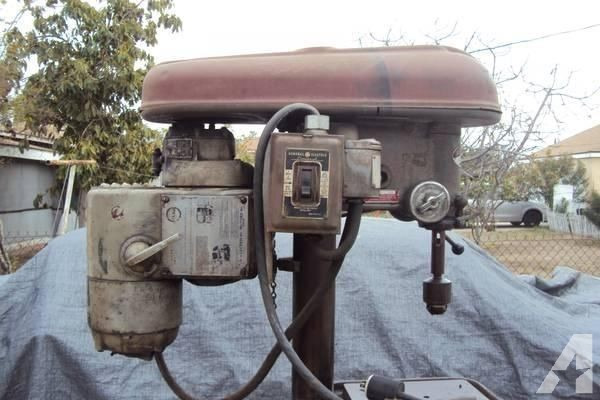 an old drill press from the 50s/60s. It's a Rockwell unit that was in a high school machine shop at some point. It's in great shape, functionally but the tower is super rusty and it's all greasy and the paint is in rough shape. It's been sitting under a cover in my shop for a while now, so I decided that while I'm waiting on a few parts (and after I about broke my wrist center drilling a tube when the drill caught) I should get it fixed up and going. Clean the rust off of the tower and oil it up nice. Clean the rust off the table (not too much here) and oil it up nice. Repaint the top cover and knock out the dents. Repaint the painted parts of the body/base. 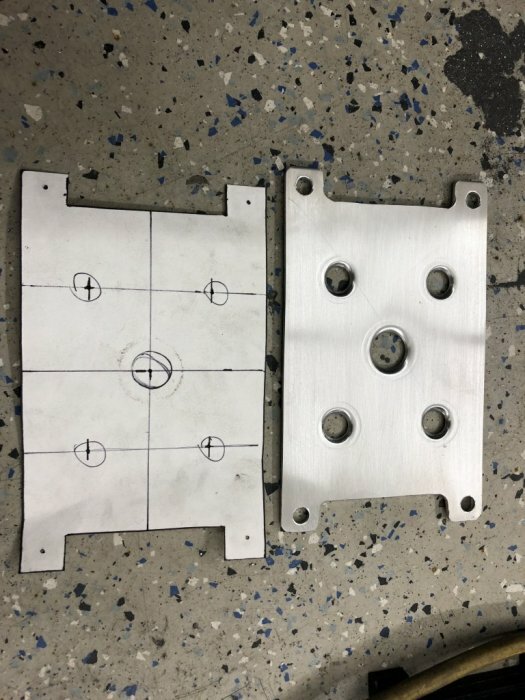 Add an XY vise to allow easy positioning of parts. Fix the depth indicator (it does not currently spin). I'll snag some pictures tonight of the progress thus far. So far all I've done was pull the top belt drive cover off and strip some paint on it. I figure we're all tool nerds here, so people might appreciate seeing a cool old tool. It's a big guy, around 5.5' tall and HEAVY. I have it sitting on a furniture dolly to move it around. The Lounge / IT Guys - ELK/Elastic-Stack - Anyone using it? So as some of you know, I recently changed jobs to a new company. Well, we're not going to get into too much detail, but I'll be going back to my old company in around a week. The new place is great, but they don't have enough workload to keep my pipeline full and I have to be busy to be happy. That's neither here nor there though, as I'm here to talk about ELK/Elastic Stack. Anyone using this? It's a data aggregation/analytics toolset, basically and open source. That's most of what I've been doing the past couple of months and I've been writing a bunch of dashboards/logstash filters/syslog-ng configs, etc for it. I figured I'd see if anyone was using it and if so, if they wanted to share any data and I can share all the work I've done with it. Most of what I've been doing is organizing Cisco route/switch logs, Cisco ASA logs, Netflow data and Cisco WLC (Wireless) data and building dashboards for all of it. I'll probably be adding some Palo Alto and Checkpoint capability shortly, when I get back to my old company. Anyway, I know there are a few IT guys around here and I figured I'd see if anyone had any interest in it as I'm able to share my work and I think it's pretty neat stuff. The Lounge / 3D Printer Build Thread - Any interest? In honor of @Dvous build thread for his CNC machine, I figured I'd see if anyone was interested in a 3D Printer build thread as well? Dual Extruder; one direct drive, one bowden. MGN12 guide rail supports for Z stage. Not sure on 2x, 3x or 4x for this yet. This will be a pretty serious machine, as hobby printers go. The goals are to have very rigid stages and belt control while keeping weight as low as possible on the moving parts of the XY kinetics. The direct drive adds some weight, but I'm willing to trade a bit of speed for the ability to do flexible filaments in 1.75mm; going bowden for the second extruder will help keeping it as light as possible at least. 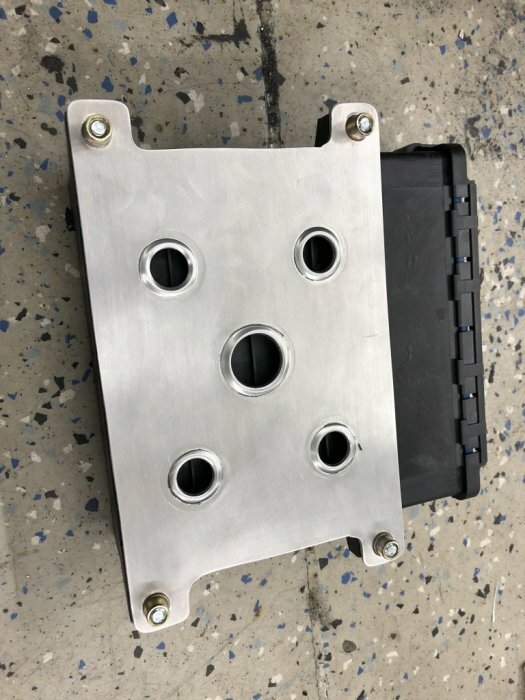 The Z stage will be heavy on purpose as the motor can drive it (it doesn't move quickly anyway) and the weight should help damp vibration (I can always add weight/adjust it if I have any resonance). Just curious if anyone is interested. I'm moving on to a newer, bigger machine so I have my Robo3D R1+ for sale. Mine has had an LCD added, cable chain added, spool holder added, upgraded Wade's Extruder and a few other tweaks for improvement. It does have a small chip in the bed near the middle from a Y perspective (to the right of center from the X perspective). It's about the size of a dime and a little less than a millimeter deep at the deepest point. I just work around that small area as it doesn't really affect anything as long as you don't start an edge directly in the middle of it. Anyway, I'll ship it with a small spool of filament, ready to go, freshly tuned up running the newest Marlin RC1.1 firmware with ABL turned on (I use MBL but ABL is easier for a beginner, though MBL gets better results). Asking 400 shipped in the CONUS, 350 picked up (it'll cost a bit to ship because it's pretty damned big). Anyone interested? It's a good working machine, probably 300 hours of printing time on it. Belts/motors/ramps are all in excellent shape and I keep it cleaned/oiled. I use it with Simplify3D, but it works a-ok with Cura, Repetier host and MatterControl as well. Simplify3D license won't be included with it (I use it on my other printers). 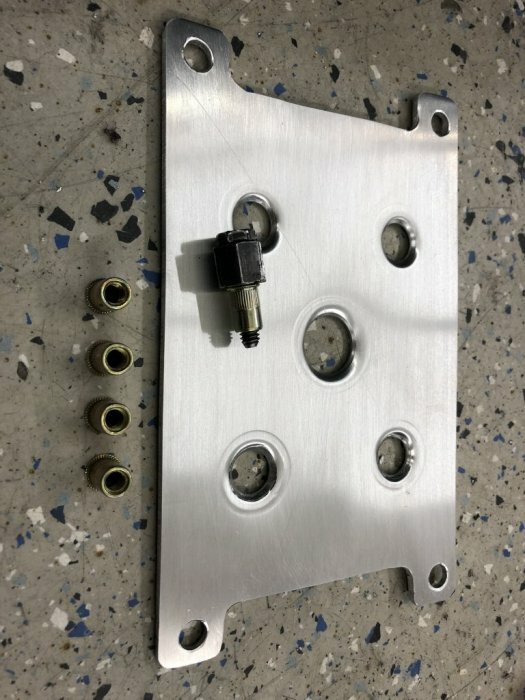 General Tech / Designing a metal brake... input? 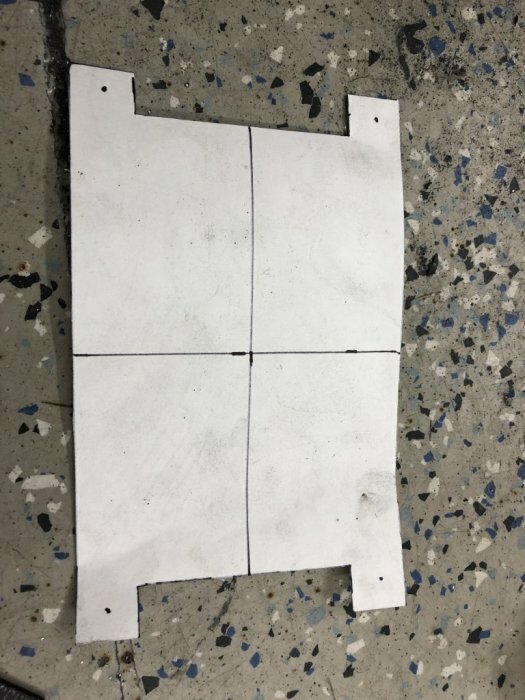 So I need a metal brake to do some fabrication on my car. Namely radiator shrouds, aluminum rear belly pan/diffuser, and a few other things. I've looked around at quite a few of them and I'm pretty nonplussed by the ones that cost less than 500 dollars, and the ones that cost 500 dollars look like something I can make for <100 dollars. Plus, hey, welding practice. It'll be a little less beefy. 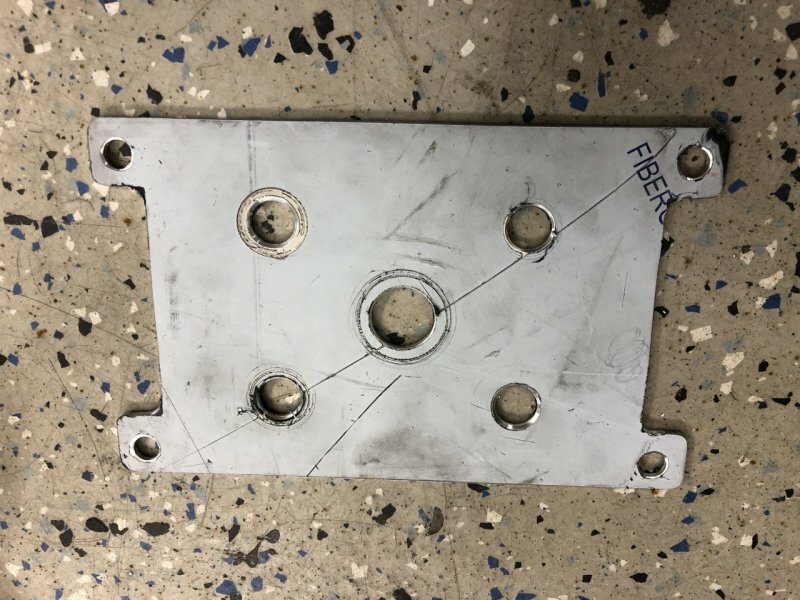 I want to be able to bend something like .090 aluminum and .063 steel plate, so I'm planning to build it with 1/4" thick angle iron and C channel, then just weld in a few supports here and there to help keep it all true. 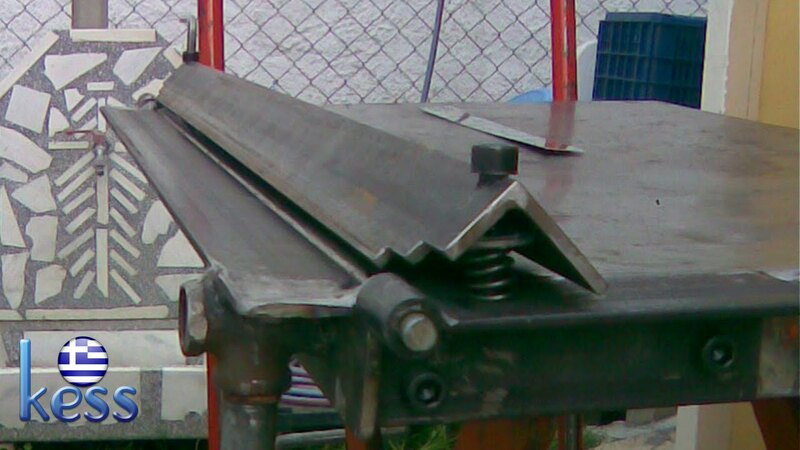 I am definitely going to do the spring loaded clamp bar as that looks super helpful. I think I'll also do a stand for it while I'm at it. Anyone done anything like this? Thoughts/ideas?